As a society we decide what pieces of music will become "classics". Most so-called Classical Music was chosen by people long dead but we living humans get to sneak new pieces into the canon occasionally. These days one of the pieces we the people are making "classical" is Terry Riley's In C - an orchestra piece of utter simplicity and massive power. It speaks to us of musical patterns and formal structures, it hints at changes in social relationships and organizational hierarchies. There ought to be no podia in In C. Every performer in In C has to be creative. It marks the passage of time (about the only thing every single piece of music does one way or another) in a way no other piece ever had before. Written in 1964, it is clearly one of the most talented children of the sixties. On May 28, 1978, (30 years ago today) In C was the centerpiece of the final concert of the Second Second Story Series. Without it the entire series would have merited little attention back then - and even less now. But the energy generated by this one performance became a kind of landmark for the ICA, an inspiration in seasons to come. It was the sort of success every beginning arts organization needs. 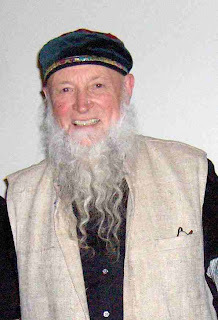 Here is a portrait of Terry Riley taken by Robert Jacobs back in 1978. At the end of this post is a picture of Terry today and some links to information about him and his music. In C was already well known by 1978. It had been released on a Columbia album - which had been a personal inspiration and refuge for me in my graduate student years at the Herb Alpert School of Music, a musical relief that I might listen to twice or three times after many a hard day studying ugly comtemporary music. 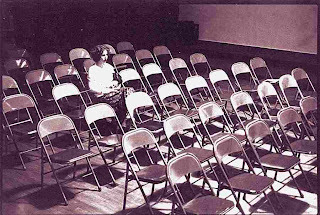 But In C had had few performances in Los Angeles (actually none that I'm aware of). ...it is difficult for composers to get their work performed. Especially if they are young and unknown. (Perhaps if they were very young - twelve or thirteen - it would be different. Audiences tend to put up with a lot of nonsense from pre-pubescent musicians.) The ways around this are not legion. You can have your parents buy you an orchestra; you can stay in school forever, being performed on the obligatory student composer concerts and heard by practically nobody; you can threaten to hold your breath until Zubin Mehta agrees to perform your piece; or you can organize and try for a frontal assault. I also discovered an aircheck of a regular Saturday night KPFK radio show called Zymurgy. 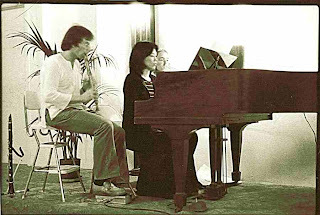 It was hosted by Carl Stone and Leni Isaacs (now Leni Boorstin, an important honcho of the Los Angeles Philharmonic). 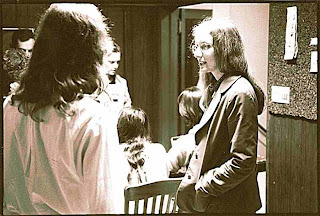 The night before the In C concert the guests on Zymurgy were Anna Rubin, Robert Jacobs and myself, "Dave" Ocker. We sounded very young and earnest. I've extracted a few quotes from the interview down below somewhere. I've uploaded the show as an MP3. I probably made this tape myself using some sort of automatic timer to record off the air onto two crappy cassettes. I've cut all the music selections down to one minute or less. The recording quality was not good enough for music. The two hour show lasts about 50 minutes, including a commercial for a strident Helen Caldicott in a futile effort to speak truth to power at the end. The musical snippets will give you a vague idea of the diversity of music on this series - with the emphasis on "vague". As this is the only Second Second Story Series audio document which I'll be posting to Mixed Meters you'll just have to make do with vagueness. 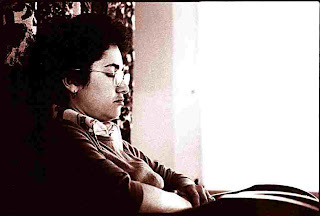 Click here to listen to Leni Isaacs Boorstin interview Anna Rubin, Robert Jacobs and David Ocker on KPFK radio Zymurgy program, May 27, 1978. The final concert received four separate print reviews. The most amazing was by the late Daniel Cariaga of the Los Angeles Times. I once heard Ara Guzelimian (who now rules much of the music world somewhere in New York City) express amazement at Danny's "revelation" at this concert. Recently Mark Swed recalled watching Danny sitting Buddha-like under a statue of the Buddha during In C. Wish I had a picture of that. Under half-dimmed lights in a second-story yoga classroom, between a Safeway and a Baskin Robbins, this extraordinay event took place. To one observer, the impressive closing of a second series cosponsored by the Independent Composers Assn. and Larchmont Center (the yogic connection) cause regret that earlier visits to an obviously enterprising impressarial entity had not been made. Clearly, ICA is making some things happen. For the first time in recent memory, there was a real sense of occasion at a new music concert. The Independent Composers' Association pulled off this minor coup in the unlikely but pleasant Larchmont Center for Yoga at the final concert of their second season Sunday night. The uncommonly large and excited crowd came for a rare local appearance by Terry Riley, who led a performance of his "In C."
I saw that the '60s never ended, and in fact began a creative musical tradition, at a concert put on by a group of young musicians called the Independent Composers Association in Los Angeles Sunday night. That the program took place in the Larchmont Center for Yoga suggest how the avant-garde (this part, at least) has matured beyond the need to be outrageous. Despite the outrageous heat, the young, hip listeners (some with infants in arm) displayed as serious musical concerns as the very committed musicians. 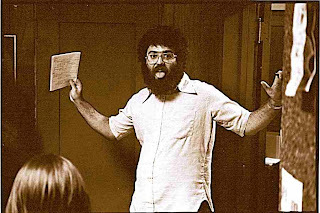 Read the entire article by Bill Arthur, "Independent Composers performs in Los Angeles", May 30, 1978, in the Long Beach Independent and Press-Telegram (a newspaper with both morning and evening editions). Months later a magazine called Synapse published this review by Colin Gardner. It was entitled "Terry Riley, In C". This particular performance was something of a revelation. The excellence of the musicianship was aided by the receptive condition of the audience, our sensual perception having been heightened by the incredibly hot evening and the absense of air conditioning in the hall. Most people were beginning to feel groggy by the beginning of In C and the perpetual pounding rhythm of the pulse and repetitive overlays of the 53 figures produced an intense experience as if being pounded into submission all the more effectively to appreciate the nuances of the orchestration. One's mind drifted into a dreamlike state for long periods, overwhelmed by the totality of the piece while at other times on could concentrate on the rhythm or on each indivicual instrument. In C is not an electronic piece, yet it somehow seems electronic, conjuring up the electronic pulses of the German sequencer-dominated music of Hoenig Schulze and Tangerine Dream. As you can tell, Colin was writing for a different type of reader than the three newspaper critics. You can read Synapse back issues here. Being exposed to my 30-years-ago self is a bit of a shock. But a few things said in the KPFK interview got me thinking. Leni asks us several times whether the members of the ICA have any artistic discussions among ourselves or musical influences on one another. I suppose she was thinking that a group of composers might have some artistic commonality or requirement, possibly even a specific manifesto. My experience of the group is that what seems to bind us together is the desire to produce our music, to put our music out. And we have endless informal discussions on aesthetics and whatever, but it hasn't had to be a part of our formal process. We haven't had to battle out a lot around new music. I learned to be dissonant, I think. I started off with a fairly melodic, harmonic idea, conventional thoughts about music. Gradually learned that there were really no rules. It's in the nature of independent composers to be obscure. Now, 30 years on, many of us have found ways to continue composing somehow or at least we've found ways to wish we had more time to start composing again. 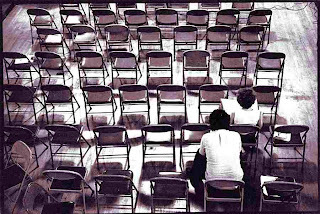 A few have become composition teachers - thereby, to my mind, losing their "independent composer" status. We are all still really good at being obscure. And we now live in a musical world where "no rules" is even more "the rule" than it seemed to be in 1978. In other words, things haven't changed much. I'm not sure I can remember any more why we expended all that energy to create concerts of new music. There must have been lots of hopes and dreams and ego and a sort of criminal naivete about the place of modern music in society. But in spite of all that I am completely sure that I'm glad I did it. By the way, these quotes from the radio show have a large number of "uhs" and "ums" edited out. You're welcome. Terry recently gave a solo organ recital in Walt Disney Hall. For a few days you can read Mark Swed's review here for free. Predictably, Mark liked it. Read all Mixed Meters posts about The Second Second Story Series here. Read all Mixed Meters posts about the Independent Composers Association (including the S.S.S.S) here. 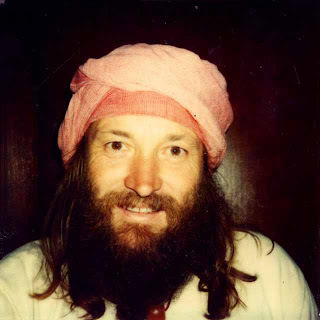 Only the first picture (Robert Jacob's picture of Terry Riley) was taken the day of the In C concert. Click on any picture for an enlargement. The other pictures were taken by "we don't remember who". Special thanks to that person. I am loving these SSSS posts! In a moment of non-sarcastic, pre-coffee, reflection I thought, "I think that these kinds of doomed-to-fail actions actually do change the world, but rarely in the way those who are doomed-to-fail think they will. But, if the doomed-to-fail did not try to drastically and radically change the entire world (thus dooming themselves), the very real and more subtle changes would be even more subtle and less real. Its all in the trying." Then I realized that I should drink my coffee, but my fingers had already made the jump.